HUNTINGTON, WV (HNN) - Mesmerizing its audience, “Harry Potter Deathly Gallows Part 2” performs movie abracadabra by saving the best for last. Unlike most “franchise” (i.e Superman, Batman, anything with an Arabic or roman numeral in the title) flick offerings have a tendency to lose fascination as the sequels increase. A few have defied the generalization, James Bond continues tossing gadgets, flirts, and suave maneuvers and “Dr No” had its release in 1962. Potter has become a youth/adult phenomenon. Most of the wizard’s fans came by a “book first” method. There are exceptions. (interview) But the mission of Rowlings was to recapture reading. 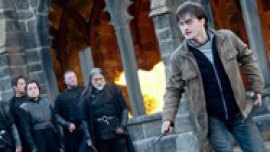 Statistics show Potter poised to pass another generation’s sci-fic icon, “Star Wars.” Potter has the advantage of higher ticket prices (including IMAX/3D), saturation exposure and multiple auditorium “on demand” times . When “Star Wars” debuted, the George Lucas flick inched into one theatre and stayed for 26 weeks or more. Those were days before multi-screen showings. Anticipation built prior to the debut screening, fans of all ages came out at midnight, including a few stray adults not dragged by a now grown child. I found one adult awaiting lowered lights with a paperback in hand. “I read a lot,” said Christine Kelly adding (yes) she has read all of the Potter novels. What has breathed longevity into the wizard which prompted fans to boast of wands, dress in costumes and reveal life size standees in their room? 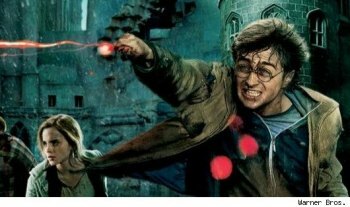 Consolidating several responses, the top formula recipes were “relating to kids,” “ putting yourself into the shoes and hands of the characters book and/or movie,” and the stress-break of escaping to a world of wishful spells where you can board a train to Hogwarts. 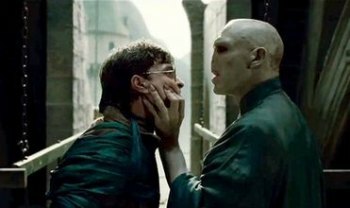 Encapsulated by editing that disallows A.D.D., intricately detailed set design , consistent characters (and character actors) , these blend astutely whether the adventures alludes to an academic atmospheric dark side or (as here) a gripping call out the stone soldiers for the Potter versus Voldemort warfare. Summarily, “Part Two” comes down to one word FUN. No analysis or symbolism necessary (some could be gleaned ), just a story that has multiple layers which touch every movie genre. Through Rowling and WB bill this as the hail and farewell, film series have the luxury of reinventing themselves or finding the cliff hanging had a ledge 20 feet below.